Pakistan’s Information Minister has announced the begin of a crackdown on those who hold dollars or other foreign money with three arrested. The announcement made on a highly symbolic day, April 5th, was met with puzzlement at Pakistan’s Central Bank where a spokesperson told a local paper there is no law to arrest any person for buying dollars or for keeping foreign money as investment. 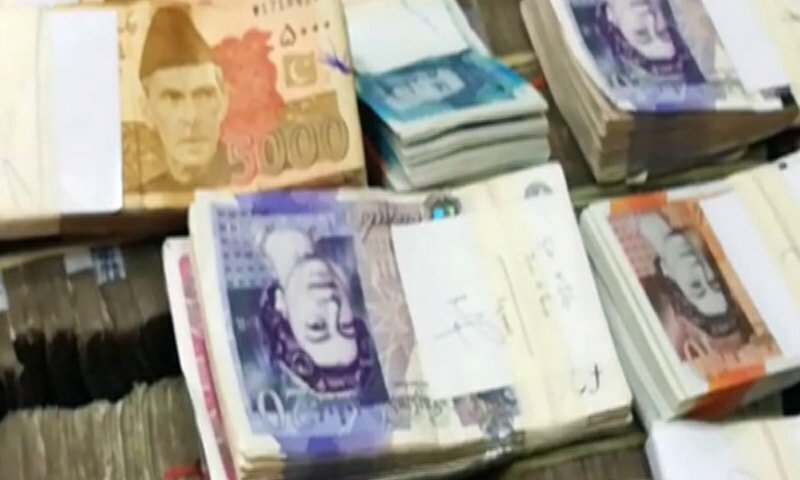 Three people were arrested on April 7th for “hoarding” dollars, pounds and other foreign currencies worth circa 40 million Pakistani Rupees (~$300,000). “The dollars were hoarded to make rupee weaker in the market. This action caused an artificial demand of dollar and its rate increased artificially,” the interior ministry said. Panic was brewing in Lahore and Islamabad after Rupee’s value fell to 148 PKR per dollar following a devaluation of the currency. The impoverished Pakistan with an economy of just $300 billion in nominal GDP and a population of more than 200 million people has been in talks with the International Monetary Fund (IMF) for a 13th bailout since 1980s. “IMF is not advising to devalue the currency. Currency value is not even discussed with the Fund. 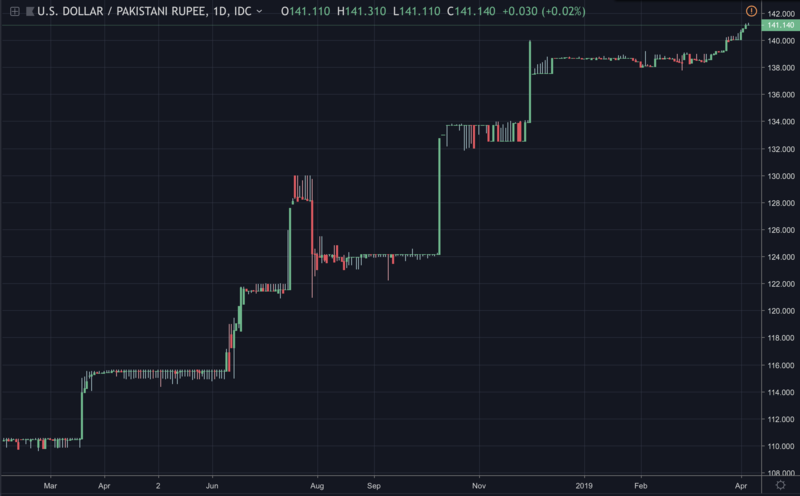 The rupee must be aligned with the market fundamentals,” Umar said. Inflation has jumped to 10%, up from 7% in January and 3.7% in April 2018, with Pakistan’s fiat value falling quite quickly. “Sellers are just 25 per cent of the current dollar trading. That means 75% are buyers, which has drastically reduced the volume of the market,” said Zafar Paracha, General Secretary of the Exchange Companies Association of Pakistan. Interestingly the central bank there is not putting forth dollars for sale, presumably because they don’t have any, so it seems they’re going after anyone with a stash of dollars or other foreign currency presumably so that the central bank can then have some to sell. The only complaint here appears to be that these three unnamed individuals arrested yesterday bought dollars, and from the shared picture, pounds as well as other foreign currencies. Foreign currency seized in Pakistan for “hoarding,” April 2019. Bitcoin and other cryptos are illegal in Pakistan as far as we are aware, but about $300,000 a week exchanges hands on the peer to peer exchange LocalBitcoins. There was recently some suggestion they might regulate crypto exchanges and thus perhaps decriminalize, but we never went with that story because we couldn’t quite make sense of it. Hearing these reports now, it appears quite unlikely they will welcome crypto any time soon. The value of Pakistani money has plunged 40% since last year against the dollar, much of it due to intentional devaluation. They have seen some reasonable GDP growth at 6%, but the base interest rate is an incredible 11%. When accounting for the 10% inflation, the Pakistani economy has effectively contracted by 4%. Seeing these reports of arbitrary confiscation of wealth, such contraction is perhaps not surprising. They took no bitcoin however. Not that we’d know whether they had any. Nor, presumably, would the authorities know.